The Simpcw are a Culturally Proud Community, valuing Healthy, Holistic Lifestyles based upon Respect, Responsibility and Continuous Participation in Growth and Education. The Simpcw, who now have a membership of nearly 700 people, traditionally were noted for their hunting ability, and had many travel corridors and trails. In the summer months during their seasonal round on the land from spring to the autumn or fall season, much of their time was spent in hunting camps in the mountains above the North Thompson and upper Fraser Rivers. Both river systems provided salmon, which were caught in weirs, nets and by spear. Meat and fish were smoked or dried then stored for consumption. Numerous plant resources for foods, medicine and technology were also collected and preserved for winter use. There was active trading, among the Secwepemc and other Nations. Sometimes warfare with other Nations in BC and Alberta over natural resources. Presently Simpcw people maintain traditional knowledge, and continue to practice many of their traditions while learning and working in modern society. The Simpcw First Nation band members are constantly working towards creating a strong future for their people. They are continually moving forward as a community while working to preserve their culture by balancing modern-day activities with strong cultural values. The Simpcw do this by working towards economic sustainability, while teaching values, traditions and language to not only the youth but other band members as well. The SIMPCW are a division of the Secwepemc, or Shuswap, whose traditional territory encompasses approximately 5,000,000 Ha in the North Thompson region. 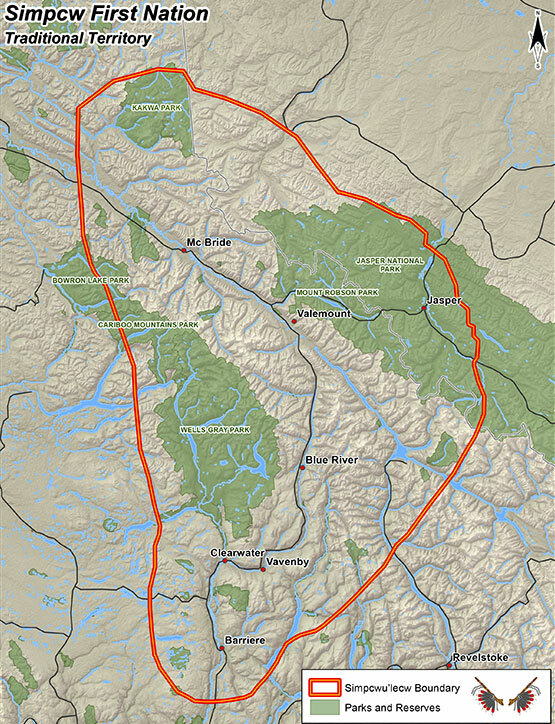 The area extends from slightly North of McLure to the headwaters of Fraser River near McBride, to Tête Jeune Cache, over to Jasper and south to the headwaters of the Athabasca River. Archaeological studies have identified winter home sites and underground food cache sites at a variety of locations including Finn Creek, Vavenby, Birch Island, Clearwater, Litte Fort, Chu Chua, Barriere River, Louis Creek, and Tête Jeune, and Jasper. Many ancestors of present band members lived in these winter villages or camps. Evidence of life in earlier times can still be found at these ancestral village sites. Currently, Simpcwemc are located on land which are now the reserves of the Simpcw First Nation.